When I start seeds inside in those little containers, I have anxiety. If I only plant one seed per pot, I worry that it won't germinate and I will waste space. If I plant more than one seed, I worry that they will all germinate and I will need to thin them and waste perfectly good seeds. And so I stare at the pots for 10 minutes, trying to make up my mind, doing nothing. What I tried (and had a rousing success with) this year was getting the seeds to germinate before I ever put them in dirt. 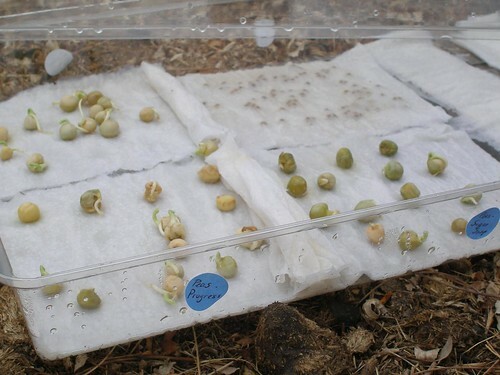 Remember kindergarten when you sprouted beans in paper towels shoved in a plastic bag? Yeah, I basically used that method. 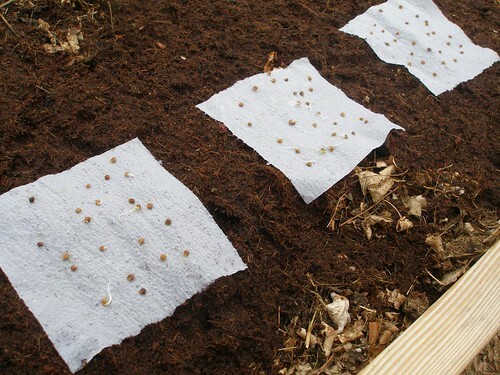 In a seed starting tray, I put the seeds on various sections of paper towels (I bet newspapers would work too), with several layers below and just one layer over top. Then I added enough water to thoroughly moisten the paper (but not enough to pool) and put on the lid. 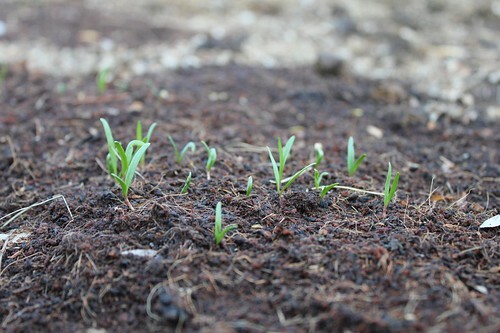 Keep an eye on them and as soon as they sprout, put them in dirt, either directly outside or in individual pots inside. If the seeds are big enough, you can plant them individually (only the ones that have sprouted- wasting nothing!). 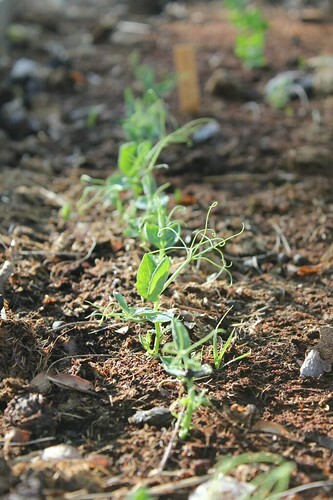 Note- at this point, because the peas are legumes, I should have applied inoculant to them. But I forgot. And had to come back later and dig it into the soil. 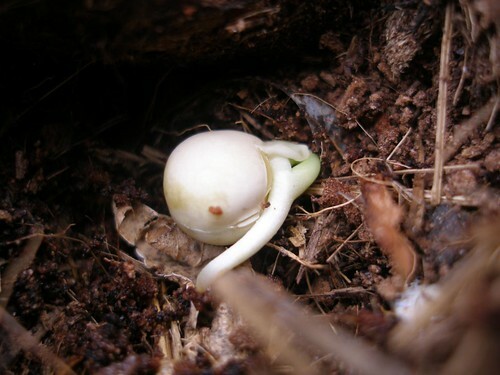 If you can determine which part is the root and which is the sprout, plant accordingly. If you're not entirely sure which end is which, just lay it on its side. It'll sort itself out. And if they're tiny, you can put them out directly, still on the layer of paper beneath them, and cover it (leaves and all) with a thin layer of soil. In a few days, they'll have popped through. 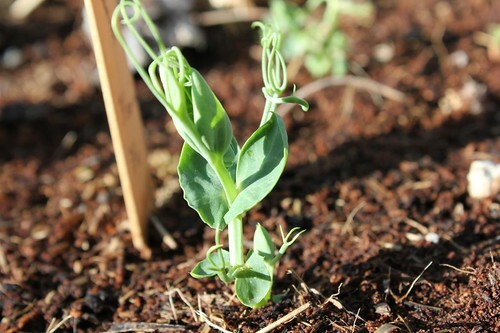 This worked really well for my second batch of pea seedlings. I'd better get them something to climb on soon. This method also seems to work especially well for plants that you're supposed to plant directly in the garden because they don't like to be transplanted. The problem with direct seeding in the garden is that it's more difficult to provide the right moisture and temperature during germination, which allows the seeds to germinate faster and in higher percentages. In fact, I found this chart that shows the optimum soil temperatures for various types of plants. For example, lettuce can get a 98% germination rate at a soil temp of only 32 degrees. But it will take 49 days to do it. At 77 degrees, you'll get 99% germination, but in only 2 days. The chart also helped me figure out why most of my spinach failed to germinate on the first go round. 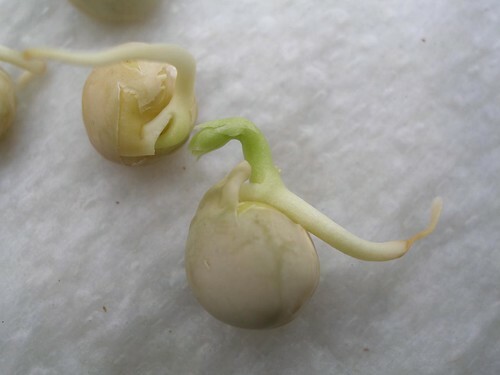 At 68 degrees, you can expect only a 52% germination rate and at 77 degrees, only a 28 % rate. It does best at only 50 degrees, the average temperature of our garage. Like lettuce, it will sprout at 32 degrees, but will take 63 days to do so. So, you know, just something to keep in mind. Thanks! 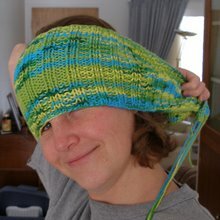 I have some old seed I am trying to use up without the waste of space or plants and have been frustrated with the most effect way to do it. This makes the most sense. What a brilliant idea! I remember sprouting beans in plastic bags when I was a kid too. :) I'll have to try this out for my garden. 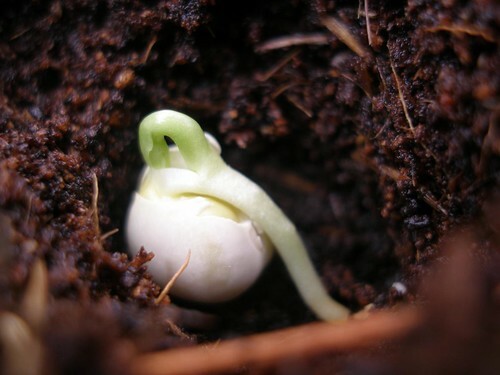 Cannabis seeds are sprouted the same way; usually into egg cartons for the first week or two.